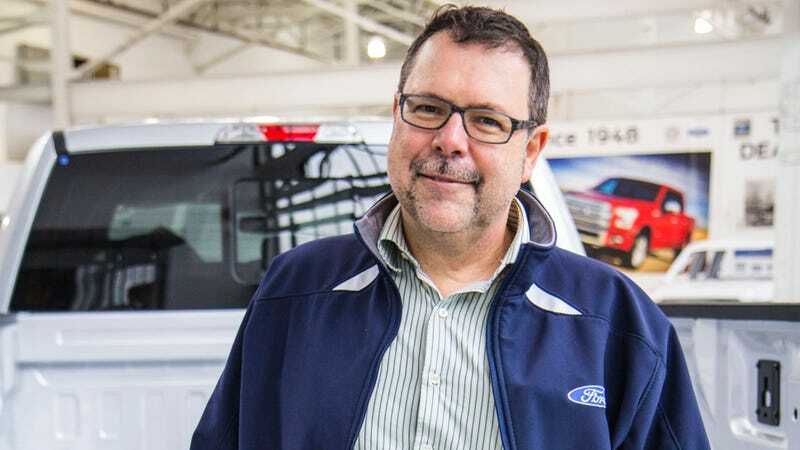 Ford Stamping Process & Design Manager Kevin Blaser was bummed when the 2015 Ford F-150 didn't address his one beef with the old truck; no good spots on the tailgate to rest a beverage or a few shotgun shells. So when he realized a new tool was being built to stamp tailgates; he made a design request. Blaser works out of the Ford Product Development Center. He told USA Today he liked to take his truck bird hunting, but lamented there was "no flat spot for your coffee" and when shells rolled off the tailgate; "I'm nosing around in the grass trying to get them." He brought his issue to the chief engineer, who related and saw to it that two round indentations ended up stamped into the tailgate. Ford's truck media man called me bright and early to tell me how pumped he was about it; "The trucks you drove down in Texas didn't even have this. They got the stamping set up just as they were starting production." It's pretty cool that Ford is the kind of outfit where a line manager can have an idea heard and signed off on by a chief engineer. That said; these little flat spots being circular makes them "cupholders" as much as me launching a Bud Light can with a lacrosse stick makes me an athlete. Yes, they're round; the same shape as a cup. Not sure how they'd prevent a beverage from spilling any more than, say, any other flat surface. I do like the idea though, so cheers to anything that enables easier tailgating!